SEOUL, SOUTH KOREA--(Marketwired - Nov 7, 2013) - Korea Korea's one of the best smart phone MMORPG development company LEMON, the developer of Dungeon Fantasy Online, is going to reveal their second representative work < GRAND CHASE ALLSTAR 3D > to publishers from all over the countries on this 2013 November at B2B in G-STAR which holds at Bu-San, Korea. 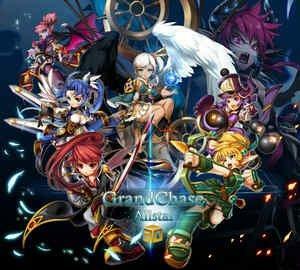 Since < GRAND CHASE ALLSTAR 3D > opened to the public, Korea, United States, and other major oversea publishers are inquiring about the license. Online version of < GRAND CHASE > is one of well-known and popular MMORPGs in the world. Mobile version of < GRAND CHASE ALLSTAR 3D > is a full 3D RPG which developed with UNITY Engine. It got reviewed as a 'strategic dungeon battle RPG that materialized original game in smart phone.' This is what well-experienced mobile MMORPG service company LEMON had developed. A big different feature of < GRAND CHASE ALLSTAR 3D > from other smart phone RPGs is the massive scale of dungeon battle system. It contains 6 continents and 50 dungeons that require strategic party collaboration, and also a player can participate the combat with up to 40 friends at the same time. And it also supports auto-combat mode so the player can play the game much easier. Also < GRAND CHASE ALLSTAR 3D > prepared the Power Relation Battle system. Players select a power side and start the massive scale of battle. < GRAND CHASE ALLSTAR 3D > is planning to open the service on beginning of 2014 in local markets. Since it has developed for multi-platform service, it will be launched in both all Android and iOS stores (markets). Hyo-Sung Yoon, CEO of LEMON, expressed his confidence about < GRAND CHASE ALLSTAR 3D > which will bring the new trend of smart phone RPG in 2014. He said this project was not open to the public so far, but he is opening it at G-STAR 2013. LEMON, the best Game Contents Provider, is a mobile development company which was established in June 2000. We have our own high quality developing MMORPG technology. Our main development content is mobile online game which requires network connection. We've commercialized more than 10 kinds of mobile games including Brain Survival that require network connection since 2003. We've developed various features of games and have services in local 3 telecommunications, App Store, and Google Play Market recently.